The Nativity Story (sometimes simply known as "The Nativity") is the story of Jesus' birth as told to us in the Gospels. There are differences between the accounts in the Gospels, but the fundamentals of the story are the same. Mary was visited by the archangel Gabriel and told she would bear a child (the Annunciation). Mary, and her husband, Joseph, had to travel to Bethlehem, for a census. When they reached Bethlehem, they were unable to find accommodation, and they had to stay in a stable. It was in these humble circumstances that the Lord Jesus Christ was born. 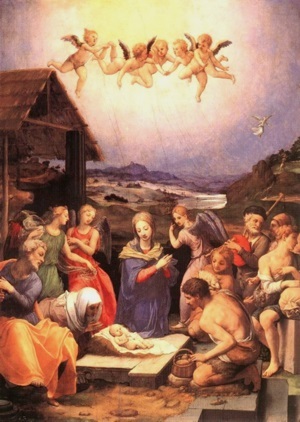 An angel visited nearby shepherds who then come to see the baby Jesus. Later the baby Jesus was visited by the Magi, wisemen from the East, who had been led to place of Jesus' birth by following the Star of Bethlehem. As mentioned, there are some minor differences between the accounts in each of the Gospel (and not all elements of each account are found in each version of the story), but the basic story is the same in all the Gospels.